What is red tide? Red tide is a situation where there is a large concentration of tiny harmful organisms in the sea such as microscopic, single-celled algae called dinoflagellates. The common name arose because the large number of tiny organisms colour the water. These colours range from green, brown and reddish orange to purple. The phenomenon is NOT related to the tides and is thus more correctly called an algal bloom. (Algal blooms can also occur in freshwater rivers, lakes and other water bodies. Red tide is a term applied to algal blooms in the sea). What causes an algae bloom? The causes are not clearly known and blooms cannot be easily predicted. In some cases, the blooms may be natural and related to nutrient upwelling or other seasonal changes in the ocean. In others, a bloom may be triggered by nutrient inflow into the sea. These may be due to coastal pollution from farmland or untreated sewage, or even seasonal winds that blow particles from the land into the sea. Changes in the sea temperature may also affect blooms. Are algae blooms dangerous? Not all algal blooms kill. And some algae can kill without being concentrated enough to be visible. A bloom can be dangerous because the tiny algae produce toxins. Filter-feeding animals such as bivalves concentrate these toxins. 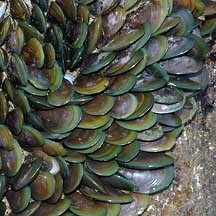 The toxins do not harm the bivalves, but can be fatal to humans and other animals such as otters that eat the bivalves. The toxins are not destroyed by cooking. Crabs and other marine creatures can also concentrate these toxins. For some kinds of toxins, anecdotal evidence suggests that people who swim or inhale such toxins dispersed in the air may experience irritation of the eyes, nose, and throat, as well as coughing, wheezing, and shortness of breath. Additional evidence suggests that people with existing respiratory illness, such as asthma, may experience these symptoms more severely. People should also avoid going to the areas affected by the bloom. At other times, filter feeding sea animals may also concentrate other unpleasant chemicals and bacteria which could make us ill. 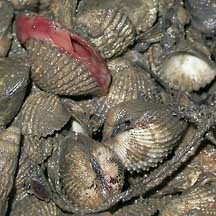 Blood cockles are among our favourite seafood! The Harmful Algae Page at the Woods Hole Oceanographic Institution: all about algae that can cause harm. Toxic and Harmful Algal Blooms on the Bigelow Laboratory website: including educational activities for the classroom about such blooms. Clam Research Sheds New Light On Red Tide on the Science Daily website: Study shows that clams can develop resistance to the toxins of red tide, with applications for clam farming and medical understanding of the nervous system. Harmful Algal Blooms (HABs) on the Centers ofr Disease Control and Prevention by the US Government. On the wild shores of singapore blog. All posts about mass fish deaths in Singapore.